On March 24th Smava.de launched its peer-to-peer lending service in Germany. Time for a recap on how Smava fared in its first 6 month of operation. How Smava operates can be read in this earlier article. First the very positive news: So far in only 3 cases borrowers missed payment dates and in two of these cases the borrowers payed with only a few days delay. Therefore only one loan is currently late, resulting in that more than 99% of all loans are current. On the usability and interface side there have been no problems or complaints, the interface is working as expected. Thereis however room for improvement, especially in the account section where the handling gets a little clumsy once the lender has many loans. But despite receiving very positive and extensive media coverage Smava so far failed to achieve mass appeal. While Smava says it has over 13000 registered users, Wiseclerk figures show approximately 250 active lenders and 180 active borrowers. 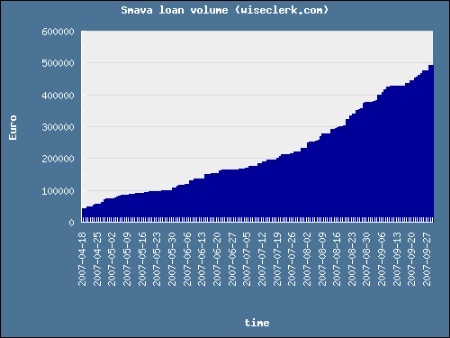 In the 6 month Smava handled a loan volume of 500000 Euro (approx 0.7 million US$), rather tiny compared to the loan volumes Prosper and Zopa handle. One move to foster growth was that Smava opened to lower credit grades in the beginning of August. 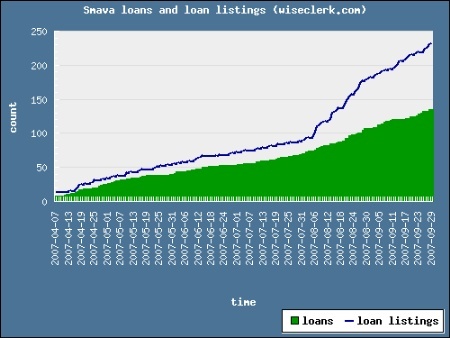 While this led to a rise of loan listings (see chart below), fewer of the new loan listings were funded. But still over 50% of loan listings do get funded. 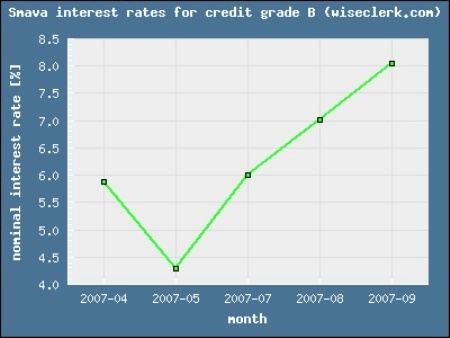 It is to early to judge how the low credit rate loans will impact the default ratio. Possibly the main reason for Smava’s slow growth is the effficiency of German banking. German banks have automated the consumer loan process and small consumer credits have interest rates (APR) of as low as 4 to 5% (for best credit grade). At Smava the interest rates at which loans are funding have risen compared to launch date, voiding the argument that Smava offers better rates then a bank for many cases. Smava is still faring well in the absence of serious peer to peer lending competion. With Dutch Boober troubled by regulation worries, the long announced plans of Boober to expand into Germany have yet to happen. Smava avoided regulatory problems in the first place because it partnered with a bank, which fulfils all regulation requirements. Like Prosper Smava has yet to define the benefit of groups, which exist but have no plausible way of influencing/reducing the default risk.